Aviation industry regulator, the Nigerian Civil Aviation Authority has started probing the ArikAir pilots and officials of the Federal Airports Authority of Nigeria over alleged security breaches that led to the arrest of a 15-year-old stowaway, Daniel Oikhena, at Lagos Airport on Saturday. This is even as the boy on Wednesday landed a scholarship to study free to university level and fulfil his dream of flying to the United States of America. The pilot, The PUNCH learnt, might lose his licence or be fined huge sum of money if ongoing investigation by the regulators found him guilty of not aborting the flight for safety checks, following the alleged passenger's report of presence of a strange boy some metres from the plane. Already, the regulatory authority has commenced full investigation into the matter, the Director-General, NCAA, Captain Fola Akinkuotu, disclosed to our correspondent on Wednesday. Although the NCAA boss declined to specify the nature of penalty it would impose on Arik Air, its pilot or the Federal Airport Authority of Nigeria if they were found guilty, he however said, "If at the end of the day we discover that somebody has not done what it should do, then the appropriate sections of the law will take its full course." Akinkuotu stressed that there were penalties and sanctions for breaches in the sector' and assured that the regulatory agency would not shy away from upholding safety and security regulations in the aviation sector. On the blames being traded by Arik and FAAN, the NCAA boss said the investigation would reveal whoever was liable. He said, "Arik might say that FAAN did not provide adequate security, but safety challenges are assuming new trends everyday. The responsibility of any flight lies with the operator. Arik too has responsibility. It was reported that a passenger raised an alarm. If there is merit in that, it means there was a possibility of doing something about it. All these our investigation will unravel." The NCAA boss however said that the agency, in the meantime, had put in place measures to stop future re-occurrence. "Every aircraft that is departing will be followed until take-off. FAAN security will follow them. On our part, we have to continue to monitor everything. There will be greater monitoring at the perimeter fence and access control now." Akinkuotu said that the issue of stowaway was age-long and not peculiar to Nigeria and the aviation sector. "Stowaway has been age-long since the time when ship was invented; those with criminal intent will also be looking for ways to break the law," he said. Aviation security expert and former Military Commandant of the Murtala Muhammed International Airport, Group Captain John Ojikutu, retd, said the Benin incident had shown that the NCAA needed to audit and investigate the Arik Air security programme and the Benin Airport security programme. Ojikutu said, "That boy could have been a courier for terrorists. The NCAA needs to find out how the boy knew part of the aircraft and where to enter. How are we sure somebody did not assist him. If the Benin Airport access control and perimeter fencing is not porous, how did he get into the aircraft." Meanwhile, Oikhena has been offered a scholarship by the De Raufs' Volunteer Group, a group of supporters of Osun State Governor Rauf Aregbesola. 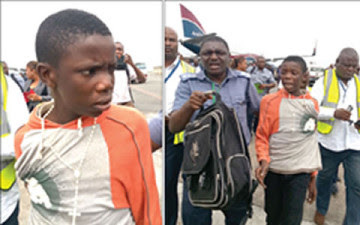 The Director-General of the group, Amitolu Shittu, in a statement on Wednesday, said the scholarship was offered to the stowaway to enable the boy to achieve his target of travelling through the air.